The long national nightmare of Richard Nixon's political career is over. 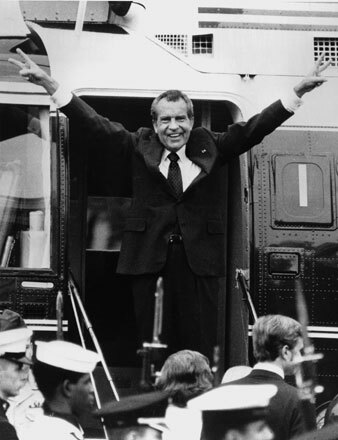 Nixon says goodbye after resigning the presidency, Aug. 9, 1974. The long national nightmare of Richard Nixon’s political career is over. We won’t have Nixon to kick around any more. He produced his own last crisis. The danger had always been that he would take the rest of us down with him. I feared that, especially after the 1972 election, which left him bereft of further offices to run for. His world at an end, would he then demolish ours, yours and mine and the children’s, and the United States he loved so much (he said)? We have escaped by the skin of our teeth. Watergate was no “tragedy,” no “agony.” After Nixon’s resignation Gerald Ford said, “Our long national nightmare is over.” It was no nightmare at all (I never cried out in the night) but a useful, salutary event which had led us by slow legalistic means to a psychological recognition. Education was a long time getting through, but astoundingly it did. Until the moment of his confession, Nixon remained hidden, especially from Republican Congressmen whom he had long held prisoner. Then even his party fell away, suddenly and as a whole and overnight, relieved at last to have a clear reason to break. •He asserts that poor people are dishonest (“welfare chiselers”), but he lines his own pockets. •He prefers capital punishment, prisons and other forms of punishment to rehabilitation and education. •He thinks that ancient relationships among nations, involving deep traditions of language and custom, can be suddenly reformed by visits of heads of states. •He suddenly reverses himself. A dozen emphatic denials may be followed by an abrupt admission. •He eventually reverses himself. After one of our political assassinations he declared that he would meet the people face to face. But never was a President so well protected. •He denies that he will reverse himself. When peace marchers passed the White House he was watching the football game (he said). Afterward he claimed peace in Vietnam as his achievement. •He commands young men to go to war, but he does not wish to pay his taxes. •He employs the media to publicize himself when, for example, he is dramatically rescuing American boys who have become prisoners of the “enemy.” He condemns the media when they displease him. No principle appears to be at stake, however. •He opposes amnesty for young men who refused to fight in the war against Vietnam, but he seeks amnesty for crimes he has himself committed. •He asserts his patriotism frequently, and often accuses other people of disloyalty to the country. •He calls often for “unity” while dividing. •He always advocates economy, but he spends lavishly, especially for such products as military machinery. •He speaks often of bargaining from strength. When he traveled recently to Russia his situation was weaker than any President’s had ever been. •He frequently speaks of himself in the third person, as if he were not a person but an instrument. He denies the psychological life, as if to say, “What you see is what you get,” or “An edited audio tape is the same thing as an unedited audio tape.” What you hear you may believe, as, for example, “I have done my very best . . . I have tried to the best of my ability to discharge those duties and meet those responsibilities . . .” (from his speech of resignation August 8). The sentence was his—you won’t have Nixon to kick around any more—to the press in the hours following his defeat for governor in California in 1962. He was quitting public life (he said), which he usually referred to as “public service . . . my years of public service.” He was one for euphemisms and broken promises. He was never a man of principle, for which we may be grateful, since his inclinations were savage. Luckily he preferred politics to principle, seeking peace and detente once the Presidency was his, although his earlier service (the years 1946 to 1960) had been an uninterrupted period of exploitation of those American fears which made peace and detente impossible. In the process of exciting hysteria and deepening the cold war he destroyed lives and reputations, immeasurably bolstered the military establishment, and inhibited free thought and discussion in America. After entering retirement from public life in 1962 he came right out again. He could not resist the open position in the only game he played —running for office. John Kennedy had been assassinated, Lyndon Johnson was new to the Presidency, and Goldwater was a probable Republican loser in 1964. In the instant of Goldwater’s nomination Nixon leaped to his feet to address the convention. He knew a vacuum when he saw one. In defense of his 1952 gift Nixon declared that no strings had been attached to it. Kindly people had given him $18,000 to assist the process of government. None of the money was for “personal” use. It was an early instance of his technique of dissociating himself from himself. He was not he. He was a Senator, and when he spent money for Senator Nixon’s purposes the money was to be viewed as separate from his. If you could not see it that way you were the kind of person who would deprive his daughters of the dog some kindly person had sent to them from Texas. The dog was named Checkers (His Second Crisis: The Fund). A man down in Texas heard Pat on the radio mention the fact that our two youngsters would like to have a dog and, believe it or not, the day before we left on this campaign trip, we got a message from Union Station in Baltimore, saying they had a package for us. We went down to get it. You know what it was? It was a little cocker spaniel dog, in a crate that he had sent all the way from Texas—black and white, spotted, and our little girl Tricia, the 6-year-old, named it Checkers. And you know, the kids, like all kids, loved the dog, and I just want to say this, right now, that regardless of what they say about it, we are going to keep it. It was painful for me to imagine, in 1968, eight years of Richard Nixon. In my heart I knew he was unworthy. I had traveled with him in California sufficiently far to be able to see ever afterward the tricks he was up to. His methods never varied. He ran for President as he had run for Congress, igniting and inflaming fears, exploiting ignorance. I never used the phrase “President Nixon.” It was not precisely disrespect—I just couldn’t say it. I voted in 1968 in West Lafayette, Ind., surrounded by neighbors mainly sound and sturdy and mainly for Nixon. Who was I to say that my neighbors were all wrong and I was all right? I could see for myself their practical realism, their tight, safe houses nestled beneath the smokestack of Purdue. Their collective instinct must be reliable. They must know what they are doing. As for me, I must try to appear sane throughout the neighborhood, nor embarrass my children with cuckoo exclamations regarding the low, evading, lying, distorting tactics of Richard Nixon. Perhaps we don’t in any case require character in a President. Thus I tried in 1968, as I had tried in my book about Nixon, to doubt myself first and him second, saying to myself, “I cannot be all right and my neighbors all wrong; he will rise to the office as men in the past rose to the office, as professors rise to deans, and deans rise to president.” Save me from my paranoia. Save me from my excitable past. Save me from faith in my own instincts. His first term progressed. He did not especially distinguish the office, yet neither did he descend to tyranny. My doubts about myself were now and then confirmed, sometimes by a rueful friend, sometimes by a hostile stranger in the mail, chiding me for the subtitle of my book: The Last Days of Richard Nixon (1964). I had thought the book wise beyond the subtitle, but I now began to feel less and less justified to speak with authority. His last days obviously hadn’t been his last at all—my calculations were wildly wrong; you’d never catch a Purdue boilermaker reading his slide rule as drunkenly as that. I had mistaken bad language for bad character. I had mistaken bad style for meanness. I was too much word-monger, too much teacher of English, too much amateur psychologist imagining I heard Nixon doing all his thinking out loud. One of my sons, his father’s helpless captive, fixed a poster to his wall showing Nixon and Agnew on motorcycles: “Uneasy Riders.” Nixon is saying to Agnew, “We blew it.” But that wasn’t true—not yet. They’d done the deeds, but they hadn’t been caught, and it appeared as we approached the end of his first term that he was held in check by the blessings of the system. In November 1972, in a hotel room in New York City on the hard-raining night of Nixon’s second election, I was on the point of switching off the television when he burst almost unannounced to tell me that which I had already heard that evening—that he had won his re-election by the vastest majority in history. (Later I heard it was the second vastest majority.) First or second vastest it was a mandate. Well, I’d survived four years. I could survive four more. Everywhere but Massachusetts and the District of Columbia had mandated him. If ever a man possessed the liberty to try for things he desired Nixon possessed it now. What did he desire? He would “wind down” the war, he’d bring us peace and detente. He had “cooled” the campuses. Of course, these were things the nation seemed to want, not he alone, if at all. He cared nothing for issues as such, except as they were instruments of political campaigns. He had always taken a position first, and sought facts afterward. Context was all. In another context in another year he’d have gone another way. What did he desire? “He possessed no further vision of the end.” That sentence at least, taken from my book, seemed to apply now. With all his vote, all his mandate, all his opportunity now to rise to the office, what would he seek to achieve? Now was the time for things grander than those “historic firsts” of his first term; first telephone talk to the moon; introducing his Cabinet by television. Historic first followed historic first, as record follows record in sports. It is well that he never had the chance to achieve whatever vision he may have had, if any. The likelihood is that his vision was fulfilled on that November night when he’d won the vastest or second vastest majority in history, a historic first or second. The winning was all. In the game he had played for years, on the night the game aimed for, he had amassed the big score. That had been the vision, beyond which no vision existed except, it would seem, the vision of personal comfort in various houses scattered about; kept up, it would seem, at public expense. The visions I feared were the visions I imagined once Watergate began to close in upon him. In deep trouble, he might blow us all up, or take us to the bottom of the sea as Ahab took the crew of the Pequod to relieve his bitterness. Melville speaks of Captain Ahab’s “monomania,” for Ahab sought only the white whale and nothing besides, and when that prize swam beyond reach the Captain was prepared to die, nor cared who joined him. Do you remember how Sen. Joseph McCarthy, when his moment passed, swiftly sank and died? It is not difficult for me to see the same course for Nixon. For me it was the voice of the Checkers speech, the voice of piety condemning “welfare chiselers” in California in 1962, advocating capital punishment, boasting of his crises, linking Governor Brown to communism, celebrating thrift, economy, frugality, and defining education: “What are our schools for if not for indoctrination against communism?” The voice was always venturing, always promising that the speaker would go farther if permitted; nor was the promise of direction ever toward ampler health, hope, welfare, art, education or environment, but always toward a crackdown on somebody (like people on welfare depleting the country with their laziness). One’s delight in hearing for the last time the voice of Richard Nixon is no habitual antagonism, no old partisan feud, no folk rivalry. The crime of Richard Nixon is not that he broke and entered and stole but that he possessed no vision of a humane end, that his requirement for personal success was unnaturally intense, and his capacity for villainy therefore proportionate. The destruction of Alger Hiss was but an early step in career and consistent with the bombing of Cambodia. Other people’s lives were cheap to Nixon. One of his early acts as President was his granting immunity to CIA men in a cloudy murder, nor was I surprised at his eagerness to display his sympathies for the soldier Calley. All this we had heard in that voice for a quarter of a century— nothing had ever been Richard Nixon’s fault, nothing had ever been in the interests of his private objective, it was all for you, me, country, duty, Constitution: as he had once been not a man but a Senator, now he was not a man but a Presidency. At the end, however, other evidence was in, even if it was only police evidence clear enough for the most reluctant Republican Congressmen.